Acer has been making some quality laptops for quite a long time now. The company has been providing some good products at a low value. The Nitro 5 series comes in the game now and is providing some affordable gaming laptops. With Intel-Core 8th generation processors paired with Optane memory or Ryzen 5 processor, Acer Nitro 5 is coming with a power-packed performance. Starting at Rs. 65,999, Acer is a blend of all properties- gaming, performance, movie watching and more. Yes, the product doesn’t top in any field but it lacks neither. But, is the product worth its cost? Let’s check it out in the Acer Nitro 5 review below and you can buy this using Amazon Upcoming Sale. The Acer Nitro 5 gets a quite similar look as we saw in the ASUS TUF series. The build quality looks premium and is really solid. The quality of plastic is not too good as we can see from the cost of the device. 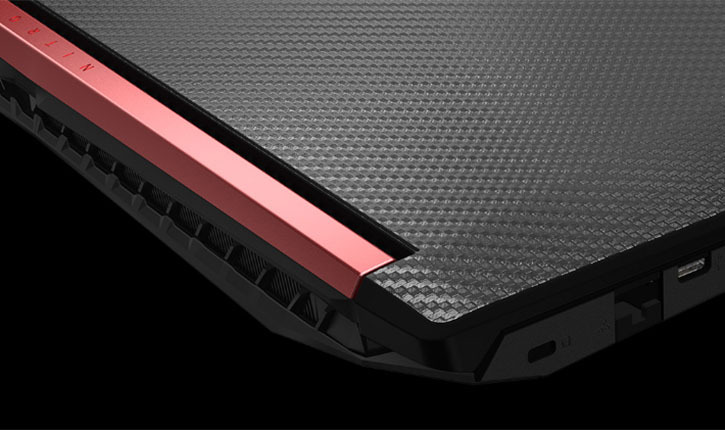 The device looks simple and it doesn’t look bulky like other gaming laptops. It is the kind which you can take for work. The black body gets the red color highlighting which makes it look even better. The Acer Nitro 5 packs two USB 2.0 ports, one USB 3.0, one USB Type-C Gen 1, card reader, 3.5mm headphone jack, LAN Port, and HDMI. Coming to the display, the Acer Nitro 5 packs a 15.6-inch Full HD IPS screen. The colors come out good and bright and the screen is not reflective. The viewing angles are decent too and anyone will like it and get used to it. Yes, it is a good display but if you are a gamer, then this display isn’t enough and won’t impress you. The bezels are thick and above the display, you get an HD webcam setup. The keyboard is really good with good key travel. So, if you are writing articles, then you won’t be disappointed with it. Also, for the better gaming experience, the keyboard has highlighted WASD keys. Trackpad in the Acer Nitro 5 is not at the perfect place and you might have to get used to it. So, if you are a gamer, try buying a gaming mouse as this mouse will be disturbing for you. The Acer Nitro 5 is powered by a 2GHz quad-core AMD Ryzen 5 2500U processor coupled with 4GB of RAM and 1TB HDD. The device gets NVIDIA GTX 1050 or 1050Ti graphics card which provides butter smooth gaming experience. Yes, you can expand the memory too but it might be enough for a gamer. The Nitro 5 gets 14,219 scores in the Geekbench 4.1 test which makes it a good performer overall. Its competitor Dell G3 15 scored 14,976 and the Asus TUF Gaming FX504 scored 12,716. Overall, the Acer Nitro 5 does a pretty nice job with smooth experience in both day-to-day work and gaming. But, if you are looking for gaming niche only, don’t stick to this one. Acer Nitro 5 has Dolby Audio support which produces nice and decent audio output while you are watching movies and playing games. The audio quality is clear and can easily fill the medium-sized room with its rocking sound. The mids and highs can be heard clearly and it is well balanced. So, listening to the songs at 80 percent of the volume can also give you goosebumps- it is a great experience. The Acer Nitro 5 can give you up to 5 hours of battery life. In the Laptop Battery Test 2.0, the device worked for 4 hours and 44 minutes with continuous web surfing at 150 nits of brightness. Coming to its competitor, the Dell G3 15 can give 6 hours and 30 minutes easily which is 2 hours longer than this one. More of the battery juice could have worked wonders with this device and give it 6-7 hours of juice which users won't get bored of. In terms of battery life there are number of options available and one can avail them using Flipkart Offers Today Special Offer. The Acer Nitro 5 is a great product which offers a plethora of good specifications. Yes, it might not be the perfect one if you are looking for gaming. But, it will give you a good gaming experience with day-to-day work. It is a good deal for daily usage and won’t disappoint you in that concern.